Each week Editor-in-Chief Liza reports on the compelling discoveries she has made in the past 7 days . Ben Giles, a collage artist that we interviewed for our second issue over two years ago, had his work featured in Time Square. I love seeing where artists that we have worked with take their careers and I’m so excited for what’s in store for Ben. I contacted him to congratulate him and check in on his life in the past two years and hear his ideas on the relationship between art and its environment. Atwood interviewed you two years ago for our second issue, what has changed since then? Where are you now and where do you plan to go? I’m about to enter my third year at Kingston University studying fine art. I’m trying to balance education work and my own personal practice, just letting it develop at its own speed rather than forcing anything. [My] collages have become more sculptural and based on creating worlds I’ve always altered. I have plans relating to conceptual audience participatory sculptures this term, as well as progressing some collage installations, making them really immersive and beautiful, just for fun–for me and for whoever enjoys it. How was seeing your work in Time Square? What's the story behind that? It was pretty great seeing the photos of it up; I wish I could have seen it in person. It would have been incredible and mind blowing. Seeing a work on a screen always desensitizes things and takes longer to settle in than standing in Time Square immersed in the enormity of it. I probably would have found it too overwhelming. It was thanks to SEE|ME, a website that puts on events. Quite a few lucky people got to have their work projected on the billboard. I rarely enter competitions or things that require sharing images and asking for likes or supports, but this paid off and I’m really grateful it did. Now that you've conquered Time Square, where is another place you'd like to see your work? Haha, I would absolutely love to have a proper solo show in London in a gallery somewhere and invite all my friends and family and people who have supported my artwork over the years. [I would] just make it lots of fun, colorful, immersive, interactive and messy, and not so serious. [I would put] everything I’ve [made] in one place. It’d probably end up burning down with the amount of paper that would be inside it. I always worry about my flat; it’s the perfect fuel for some damage. I’ve considered Kickstarter and other ways of doing it, but I’m so unorganized and wouldn’t know where to start. I’d love to have some work in Berlin or NYC too, as they are my favorite cities I’ve been to. How do you think a physical location might influence a work of art? Do you see a work's environment (whether it be the walls of a gallery, the pages of a book, the side of a building) as part of the piece itself? When displayed differently, do you think a piece of art can take on new meaning? Totally–it really impacts the work. There are many examples that can be used for site specific art and art that travels the globe and encounters new meanings and audiences in doing so: Martin Kippenberger and Oliver Laric are great to look at in completely different ways. A piece in a gallery often has a very formal association, as opposed to the “click and move on nature” of the internet. Its longevity is often diminished and its space overtaken by the next image, but a piece in a fixed location has a certain placement and home; it’s rememberable and fits with other associations: how you felt, where you were, what else you had seen. A piece in one city centre can juxtapose completely to it being in another city centre. Art and its location can have a very fluid relationship. It’s not always intentional and sometimes the work cannot exist without its intended location or base, but often it can be accidental and the viewer creates his or her own understanding without the artist ever acknowledging it. Associations can be made from different people in different places, using their own social and cultural backgrounds, as well as the social and [cultural] backgrounds of where the artwork is based. It’s amazing how artwork can form a sense of place or nostalgia to a person upon viewing it, or the impact the place can have upon the piece. A piece can take upon an infinite number of meanings, whether to its surroundings, to the viewer, or to the concept of the piece itself. The idea of art and environment is something that artists have explored for many centuries; ancient architecture being the quintessential exhibitor of this concept, many of the pieces of this time bearing spiritual connotations directly associated to the physical location of the structure. In more recent history, the “earthworks” movement or “land art” shook the art world by taking art out of the interior. 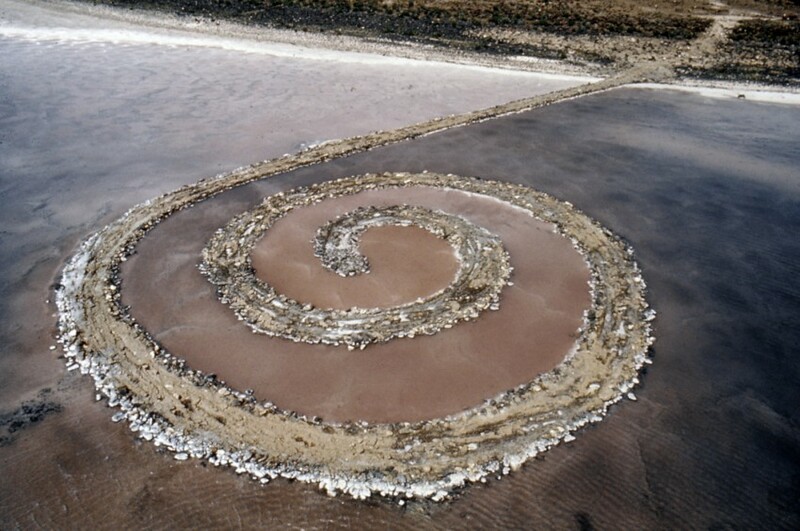 These works (one of the most famous being Spiral Jetty, 1970 by Robert Smithson, pictured below) would not have been possible without the environment in which they were created; the location acting as a major component to the work itself. Upon seeing the images of Ben Giles’ collage work in Time Square, I began to think about the relationship between art and environment today. Would it have had the same effect if it had been in a city across the globe or even on the side of a building in the East Village? Does the Internet constitute an environment? I think Ben is right: “a piece in a fixed location has a certain placement and home; it’s rememberable and fits with other associations: how you felt, where you were, what else you had seen“, even if it is a projection on a screen. Looking at art and location as it exists at present reveals our contemporary ideas of environment, which illuminates not only how we view art today, but also how drastically the meaning, whether personal or universal, of art has changed since the ancient architects. To view more of Ben Giles’ works, check out his website and Facebook page.